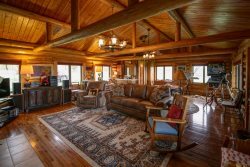 This spectacular home sitting on a large private wooded lot with amazing views of the Spanish Peaks. Ideally located just minutes from Town Center and 7 miles for Big Sky Resort. The lodge is perfect for larger groups and will accommodate a total of 14 guests. This homes amenities include a private hot tub and in those few warmer weeks in the summer this home is equip with air-conditioning (rare in Big Sky). Bear Track lodge is waiting to be your Big Sky basecamp to explore! A great place to get family and friends together. Held the boys annual ski trip at the house. Good common space to sit around and talk, get together around a large table for meals and play cards. Plenty of space and beds for everyone. Will be booking this place again in 2 years if it is available. We really enjoyed the home! It was beautiful, great location, and just an all around wonderful home. This home was one of the most beautiful in which we have stayed. We have been coming to Montana for more than ten years, and this place was the best yet! Everything was excellent, from the kitchen equipment to the hot tub. Wonderful view and close to both Mountain Village and the Meadows. What a beautiful house and scenery! We enjoyed everything about it. Plenty of room for a large group of people. Hot tub outside is worth every dollar. House is close to Big Sky/Moonlight and 2 minutes from several restaurants and shops. We look forward to coming back next year. Great trip! This is a great place, wonderful home well appointed and located. We stayed at the Bear Track Lodge for 1 month in the winter. We're skiers, both downhill and cross country. The xcountry trails are very close, easy walking distance, and Big Sky Resort is a quick 15 minute drive up the mountain. The Meadow Village is also within walking distance. This is a great place for a celebration, big enough for many people in comfort...wired for music throughout and with a great outdoor hot tub. We'll be going back for sure. Great views, giant windows, can star gaze...from inside....and did I mention the super easy to use large gas fireplace? Joe is a great host and we cant wait to go back! Amazing house and location! Joe is a great host and we cant wait to go back! Amazing rental home, worth every Canadian $! Cannot say enough about location... Minutes from the town centre, ski resort, backcountry skiing, and split-board areas. We had enough space for our large group and there was lots of storage, which many rental homes don't have. The home felt very "lodge" like, especially with the gas fireplace on in the evenings and epic mountain view. We had such a great time here, felt right at home! We would highly recommend this rental home and would book again in the near future for a fun family adventure! We had a family of 14 enjoy spring break in this beautiful setting and comfy cozy home. Our youngest one was seven months old and they included a pack and play and highchair which was wonderful. Everyone has their own space plenty of beds and bathrooms the kitchen was the gathering point enjoyed every moment of it. In the evenings after a long day outside we gathered around the fire as adults with all the kids playing downstairs with the Wii and everyone in and out of the hot tub. It was a perfect week! This is a great house for a large family or group. Set close to town with lovely light and views, it is super functional for a large group that wants to cook and eat together. It's obviously very well cared for by the owners/property managers.